Ludo Lefebvre, the enfant terrible of the Los Angeles culinary scene has struck again, partnering with the successful duo of Jon Shook and Vinny Dotolo of Animal and Son of a Gun to open Trois Mec. The restaurant, whose name roughly translates as “Three Guys” is located in a former Raffallo’s Pizza in a strip mall on Highland, just steps from Pizzeria Mozza. Lefebvre, whose itinerant pop-up LudoBites garnered significant attention as well as a massive email list, is serving French cuisine in a tasting menu format. The current pricing is $75 plus a mandatory gratuity and tax. 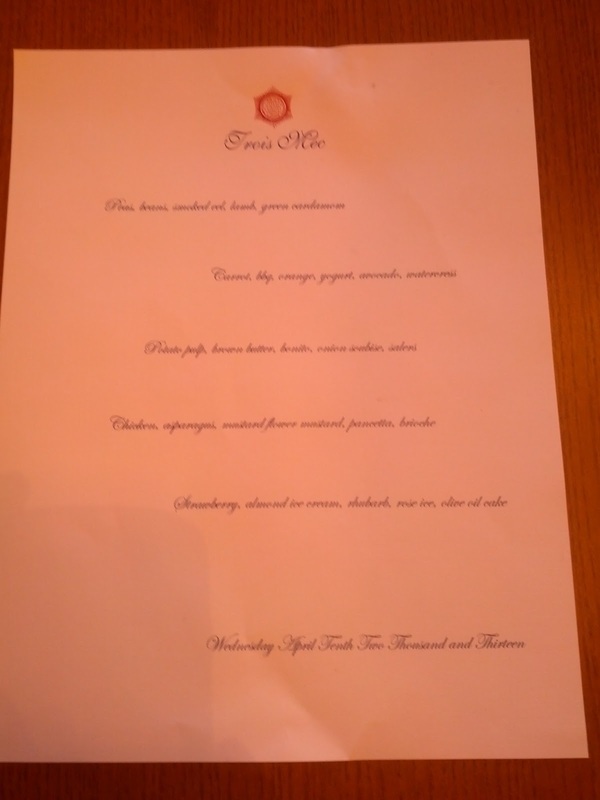 I had the opportunity to dine at Trois Mec last week, and the menu was $69, plus the same 18% gratuity. A $48 wine pairing was offered and Trois Mec is one of the few restaurants in Los Angeles that does not permit corkage. This is likely due to the size of the restaurant; Trois Mec only seats 18 patrons at tables and 8 additional diners at a dining bar facing the kitchen. The wine list was still a work in progress but at the time of my dinner was tilted towards wines at the $100+ price point, making the pairing an attractive option. Dinner at Trois Mec begins with a flurry of amuse bouches, which included a boneless fried chicken wing and a duck a l’orange in which diners drink the orange sauce once the duck has been consumed. I would not have minded a whole plateful of boneless chicken wings; just think of the possibilities of a Super Bowl party at Trois Mec. Peas, beans, smoked eel, lamb, green cardamom. The lamb was served on top of the peas and beans and eel. I shared the eel with my dining companion, so cannot comment on that element of the dish, but the lamb was rather delicious and well prepared. Carrot, bbq, orange, yogurt, avocado, watercress was the second principal course. This was followed by Potato pulp, brown butter, bonito, onion soubise, salers. The two veggie courses were quite different, with the potato course almost a puffy latke, while the carrot course was cleaner. The salers cheese was on display in a wheel that weighed over 70 pounds. Chicken, asparagus, mustard flower mustard, pancetta, brioche was Ludo’s take on the classic chicken with mustard sauce. Unlike traditional mustard sauce, this was made using the mustard flowers, rather than the seeds. It made for a different, yet familiar experience. My dining companion loved it. The concluding course in the five course tasting was Strawberry, almond ice cream, rhubarb, rose ice, olive oil cake. This take on a strawberry short cake was my dining companion’s favorite and one I very much enjoyed as well. It is rare to have a savory kitchen turn out a dessert of note, the butterscotch budino at Mozza is one, but this dish was a highlight. We were given a final mignardes along with the check at the end of the meal. Overall this was an ambitious meal and successfully executed. 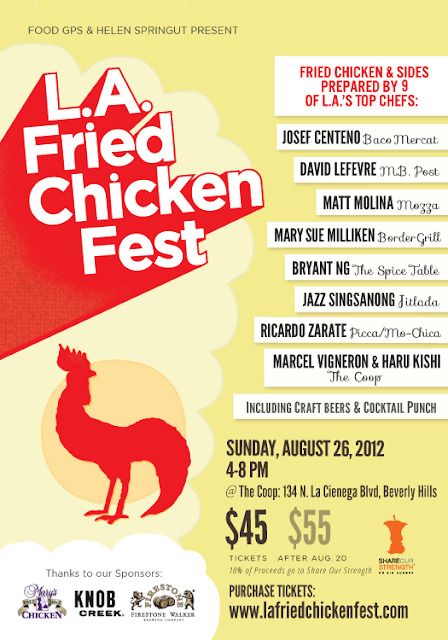 $75 for five courses plus amuses is more than fair; there is no danger of diners leaving hungry. On the night I dined, neither Jon nor Vinny was there as I do not believe they will be there on a regular basis as this is Ludo’s kitchen. Helen Johannesen, Jon & Vinny’s director of operations / beverage director, was on site to ensure everything went smoothly. It was reported by Betty Hallock in the LA Times that Trois Mec will fill its seats via selling tickets rather than taking reservations. This method, pioneered by Grant Achatz’s Next in Chicago, ensures that it will be quite difficult to get in and that the restaurant will not suffer any no-shows. As diners have paid in advance, the only bill they are presented with at the end of the meal is for beverages. Tickets can be purchased at their website here. Good luck getting in. It will be interesting to see how the resale market develops. Scalpers for a dinner reservation? Mas Malo, the "badder" DTLA sequel to the popular cantina in Silver Lake has a prime location, on the ground floor of the building that houses Seven Grand on 7th Street. The space is a former jewelry store and has double height ceilings and is landmarked. I was recently invited to check it out and was able to sample several of the dishes and cocktails. 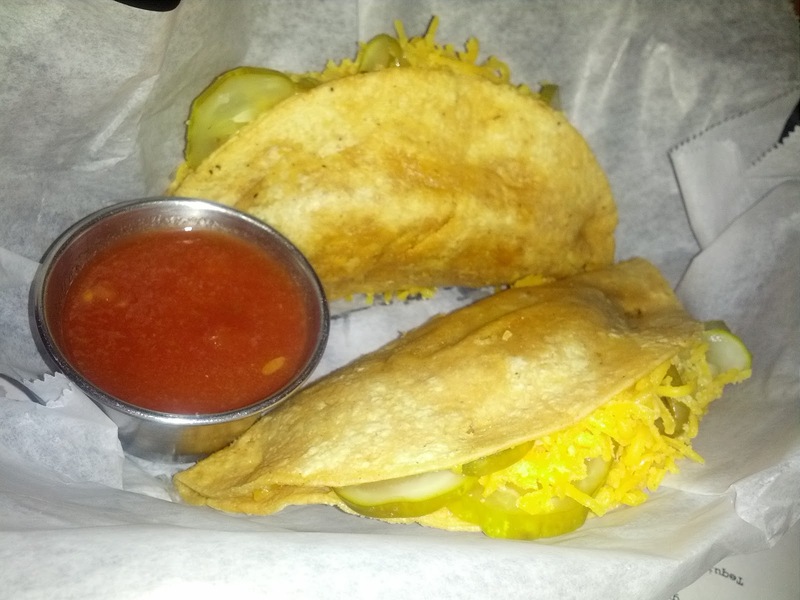 Overall the dish I recommend most is the signature dish of the establishment, the ground beef and pickle taco. It is filling, and at only $4 is a value. The ground beef, pickles and shredded cheese is a homage to the classic cheeseburger. Stuffed into the fried shell and dipped into the Serrano salsa it is surprisingly delicious and a crowd pleaser. 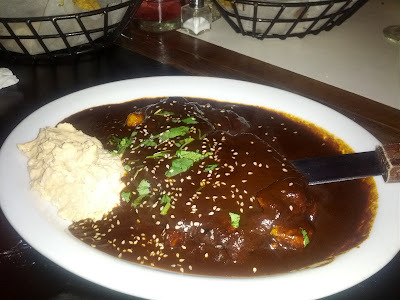 To share, the Chicken in Mole Poblano ($16) is also quite good. The mole sauce is rich and complex and not overly sweet. While it may not be at the level of Guelaguetza, this is a dish I can heartily recommend and would order again. It is hard to not dip your chips into the mole; always the sign of a successful sauce. The Medicina Latina with a chili salt rim was a highlight of the beverage menu. 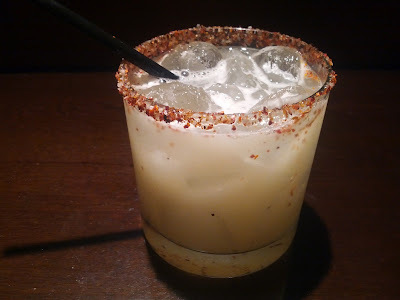 I thought the other cocktails I sampled were just ok. As they have 200 tequilas and mezcals on the list, exploring the deep list may be the optimal way to go. Unfortunately Mas Malo doesn't have sangrita to accompany the great tequilas. You can reserve their tequila vault for tastings or private dinners. 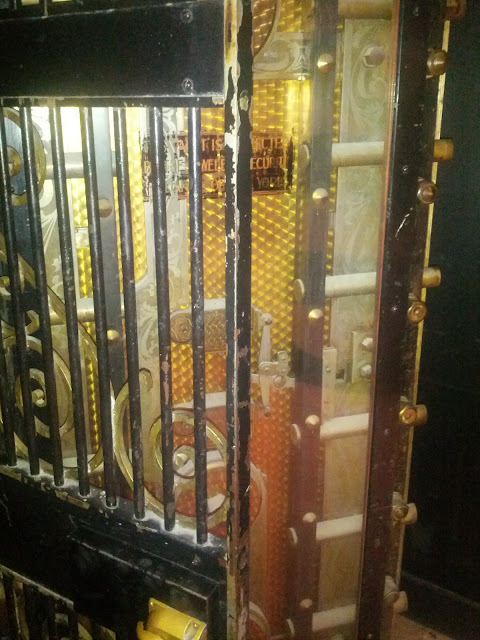 This room was literally one of the vaults used by the jewelry store decades ago. The huge glass and steel door is impressive and leads to a small room with walls lined with bottle after bottle of tequila and mezcal. The selection inside could inspire one to dig a tunnel underground and come up inside the vault, just to get to try them all. 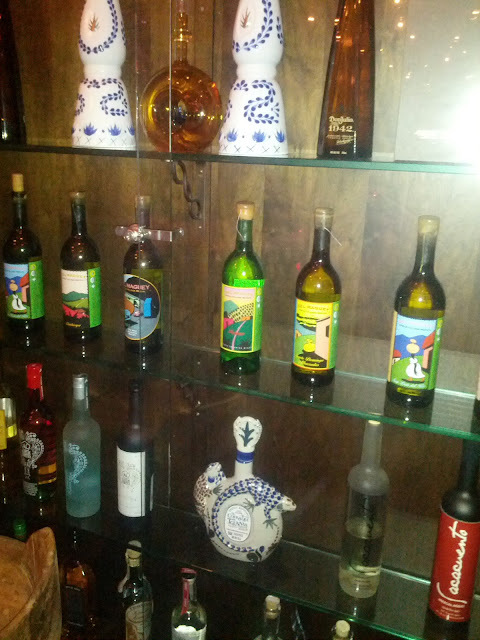 Mas Malo carries the full Del Maguey line of mezcals, including the Pechuga, made with chicken breast. The photograph below is but part of one wall of the tequila vault. Reserving the vault for a tasting may be the best way to enjoy Mas Malo; it will certainly impress your friends. Whether you are looking to sober up before or after a Seven Grand visit or are planning on having dinner and sampling the full menu, Mas Malo is a beautiful comfortable space with reasonable prices and a nice vibe. The ground beef and pickle taco has some ineluctable quality that just draws me in. Some things just can't be explained; they need to be experienced. Tom Bergin's reopened in May after a long closure to revamp the space, the cocktails and the food menu. The classic Irish pub still exudes its traditional vibe, only cleaner and with better drinks and bites. The cocktail menu was created by Marcos Tello and Aidan Demarest of Liquid Assets, who included Irish whiskey in each of their signature beverages. I stopped by when the renovation was first complete but was recently invited back to see Bergin's now that it has settled into its current comfortable form. Not to be missed are two versions of Irish Coffee: Irish Coffee and the Sheridan Special. The Irish Coffee is made with Bushmill's Irish Whiskey, hot coffee, demerara sugar and a generous serving of cream. The Sheridan's Special, named after Joe Sheridan who created Irish Coffee at the local airport in Dublin in 1942 to warm up fliers, is a cold version of the signature Irish Coffee. Their house coffee is combined with Bushmill's and Galliano Ristretto, stirred over ice and then poured into a glass and topped with hand whipped cream. Decadent and dessert-like. You can't go wrong with either. When I first sampled the Cooper Union in May, I found it to be too sweet. Either the recipe has been tweeked or the bartender is now making it properly as the current version is quite pleasing. Red Breast, St. Germain, Orange Bitters and Islay Scotch come together in this this cocktail served in an old fashioned glass. Nicely potent without overpowering, this stirred cocktail is a pleasing aperitif. The Mascushla Manhattan, made with Black Bush stirred with Benedictine, Lillet and Angostura bitters, is a very mellow Manhattan variant. Garnished with a lemon peel, this drink will relax quietly at the table rather than assert itself. Bushmill's Whiskey, Blended Scotch, orgeat and lemon juice come together in the Cameron's Kick, a classic recipe straight from the 1930 Savoy Cocktail Book. The almond syrup stands in for sugar in this take on the Whiskey Sour. This shaken cocktail is frothy and on the lighter side. The Irish Maid is the Emerald Isle's answer to the mojito with Bushmill's, sugar, lime juice, mint and cucumber joining forces in an easy sipping cocktail. The Peeled Irish Buck is garnished with candied ginger and made with Bushmill's, apple juice, ginger syrup, lime juice and soda water. Bucks are a category of cocktail made with ginger ale, ginger beer, or in this case ginger syrup and soda water, and mixed with citrus and alcohol and served in a collins glass. If you'd like to learn more, this excellent piece by Camper English goes into detail. The makeover did not end at the bar, but continued into the kitchen, as the menu consists of classic Irish dishes, executed well. My favorite items were the lamb stew, the fish & chips, the fried chicken skin and the fried cooleeney cheese. The Fried Spicy Chicken Skin (below) was crunchy and lightly spiced and was served with a Cashel Blue cheese sauce. Fried chicken skin should be on more menus around town. It isn't the most visually appealing dish, but it is delicious. The French Fries in the Fish & Chips were among the best I have eaten lately, with enough crunch but not too soft. The fish is also lightly battered, and not too oily. The Fried Cooleeney Cheese with Irish curry apple salad is an unusual dish and is recommended. The Irish Stew is a hearty stew with lamb, potatoes, carrots and onions. I enjoyed it very much, but wish that there had been more lamb in it. This dish would not fill you up by itself. The corned beef and cabbage is fine but not worth crossing town for. Langer's this is not. The Cottage Pie is another well executed potato dish, made with braised beef, so a cut above a Shepard's Pie. All in all Tom Bergins is now a winner, whether you want to get a pint or a cocktail in the main bar area or retreat to the calm of the dining room. The prices are reasonable (entrees above were $13 - $18) and the establishment is literally an LA classic. As Tello and Demarest trained the bar staff, they can execute the classics as well as the cocktail list, but this isn't the place to ask for an esoteric libation. If you come often enough, you may merit a shamrock on the crowded ceiling of the bar room. An achievement worth striving for.